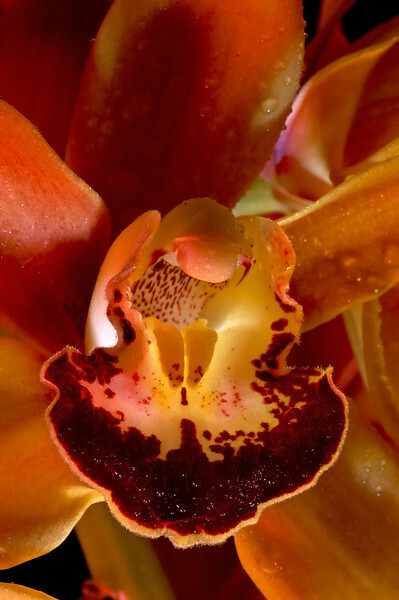 A close up look at the center of a Cymbidium ( http://en.wikipedia.org/wiki/Cymbidium ) Hybrid Orchid. Very little post-processing used, the color is from using three light sources: 1 flash wrapped with red/hot pink tissue paper, 1 flash with yellow tissue paper and 1 super bright LED headlamp used to paint with light. All of this was done inside a homemade light tent/softbox setup. Here's a view ( http://www.flickr.com/photos/fortphoto/356344948/in/set-72057594112768178/ ) in more natural light of the same plant featuring a whole branch of its flowers.